Have you noticed a strange pain in the lower abdomen? An annoying pain, difficult to ignore and that can generate more than one doubt, since its causes can be diverse. In addition to seeing what is behind the pain in the lower abdomen, we will also see some remedies that can be effective to alleviate it. Pain in the lower abdomen, even if it is a clear symptom, can also cause restlessness because you do not know exactly why it occurs. To know exactly what this pain reveals we must take into account its location, its intensity and if it accompanied by other symptoms. Thus, pain in the lower abdomen can alert a gastrointestinal problem, but also a female disorder – or linked to the menstrual cycle. Let’s look at some useful facts about this pain as well as its possible causes and remedies. First, among the most common causes of lower abdominal pain are menses. In principle, it is a symptom that accompanies the period and disappears with the passing of the days. The pain in the lower abdomen may occur during the days of the period or in the days before (premenstrual syndrome). In the first case, discomfort is maintained for the duration of the period; while in the second case, it is usually accompanied by mood alterations, increased irritability and headache. The possible solutions happen in this case to administer drugs to calm the discomfort, like analgesic. Natural remedies with herbs are also very effective. If the pain is located on the right side of the lower abdomen area it could be appendicitis, an inflammation of the Appendix, a small area which is connected to the large intestine. In this case, it is advisable to urgently seek medical advice since it may be necessary to take immediate action. When pain is related to a female disorder we should not ignore or underestimate the symptoms, since behind there may be a problem of endometriosis, characterized by loss of the inner layer of the uterus, the endometrium, and its extension to other tissues and organs. The pain, in this case, is particularly intense, acute and sporadic, becoming really unbearable. Currently, pharmacological and hormonal therapies are working well in controlling the symptoms. The source of pain in the lower abdomen may also be due to an infection in the urinary tract, such as cystitis. It is an acute or chronic inflammation of the bladder, the organ that is responsible for collecting urine. The infection can be caused by the proliferation of bacteria and germs, internal or external. The treatments are based on antibiotic drugs to counteract the action of the microorganisms responsible for the infection. 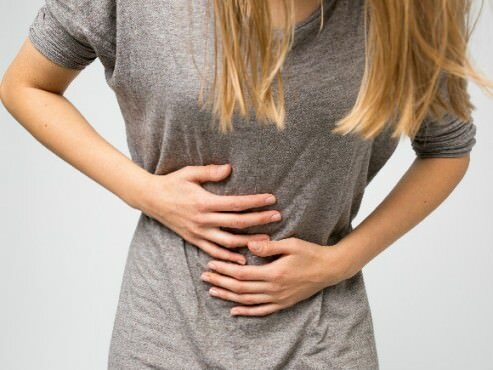 Pain in the lower abdomen, accompanied by other symptoms such as cramps, bloating, diarrhea, or constipation, may be a symptom of irritable bowel syndrome. To fight this chronic digestive disorder is essential to follow a proper diet. The physician will prescribe appropriate and personalized pharmacological treatment to alleviate the associated disorders.